When Friends of Morazán (FoM) was established in 1996, preschool teachers in Puerto Morazán expressed their desire to bring the Montessori method of education into their schools. To help make this happen, FoM provides Montessori teacher training and organises teacher exchanges between Puerto Morazán and The Clifton Children’s House Montessori Preschool in Bristol. Through funding from FoM, Preschool teachers from Puerto Morazán joined others in Leon, the regional capital for two days training in storytelling techniques and use of related teaching materials. 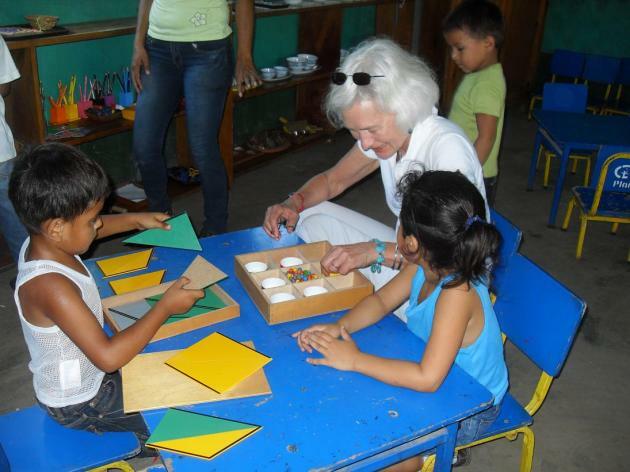 Watch these videos below to see Montessori in action in Puerto Morazan. Following on from their recent trip to Costa Rica, Cándida, Brenda and Yasmina have been receiving further training from some of the more experienced Montesorri teachers in Puerto Morazan. The training sessions are carried out once a month with the aim of helping the newer teachers develop and expand the skills which they have obtained through their training so far. This is a relatively new initiative, but the feedback so far has been very positive. In August, Friends of Morazán paid for three teachers to go to Costa Rica to receive specialist training in a Montessori School. Cándida, Brenda and Yasmina spent 8 days working closely with the Costa Rican teachers, both observing and participating in classes and training exercises. 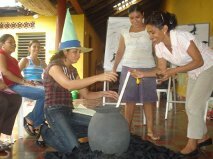 The training was a huge success and the teachers returned to Morazán with new skills and ideas. All 3 thank everyone who made their trip possible.